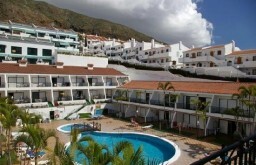 On the outskirts of Los Cristianos resort, the Chipeque apartments are a lovely quiet retreat on the hillside, offering beautiful views of the surrounding area whilst providing you with some much needed peace and quiet to make your Tenerife holiday as comfortable as possible. The small block of apartments has its own swimming pool which gives the place a very friendly atmosphere as everyone in the surrounding apartments in the block can get together. Each room has its own cable TV and a terrace or balcony all to yourself for private relaxation. There are some bars and restaurants within 10 minutes walking distance for you convience whilst still being able to retreat back to the quiet resort when you’re done. The staff in the pool bar and general hotel are very friendly and the poolside and bar are constantly being updated to make it better each year. A very quiet and friendly apartment hotel where people will benefit from the cosy community atmosphere and weekly quiz night.